Prominent & Leading Manufacturer from Jamnagar, we offer brass flange and brass flanges. 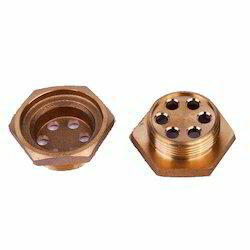 We have established ourselves as an eminent name in offering a vast array of Brass Flange. This product is manufactured using only high-quality brass and other input factors. Also, our customers can avail these flanges from us at very cost effective rates. In addition, our offered products are highly demanded by the customers due to their perfect sizes. Being the foremost organization, we rule the market by offering an exclusive collection of Brass Flanges. The offered products are precisely processed keeping in mind the set industry norms. Used for the purpose of connecting gas lines and geysers, the offered product’s quality is unmatched. Our offered array is admired among our clients for its attractive features.